To set the table in style invites to a tasteful and elegant table settings, as well as unique and personal. Take out your finest table cloths and linen, all kinds of glass and personal plates, and add things to the table that enhances the overall feeling – especially mix your table setting with items you have bough on auction for a more personal tough. Also, dare to combine classic items such as silverware with modern design. For a more personal and eclectic style, mix antique plates and glasses with contemporary and modern design objects such as vases, tables and chairs. A 28 piece 'Carina' glass service by Ingeborg Lundin, Orrefors, second half of the 20th century,. 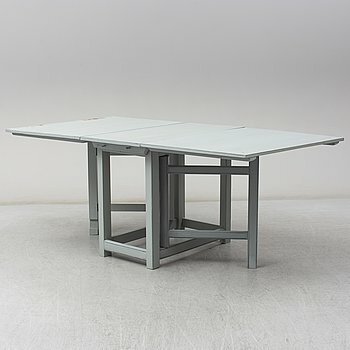 ARIK LEVY, a 'Beam' dining table, Swedese. A painted pine table, Jämtland, 19th Century. REY URBAN, two sterling silver cups, Stockholm, 1969-84. A Chinese Qianlong blue and white porcelain tureen and lid. 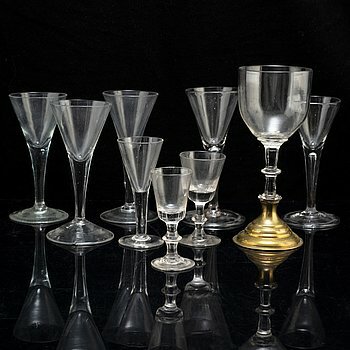 A part dinner glass service, 20th century. GEORG JENSEN INC USA, a sterling silver bowl. 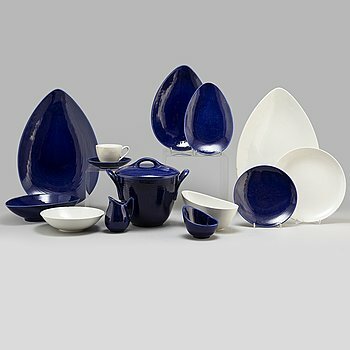 A 10-piece porcelaine 'Cobalt Net' service, Lomonosov, late 20th Century. A set of two Chinese Wanli blue and white porcelain bowls. A Chinese porcelain Qianlong serving dish and saucer. A Japanese porcelain Edo bowl, 19th century. NIELS OLE MØLLER, a set of 4 1950's-/60's teak chairs. A bowl and a Chinese jar, Qing dynasty and 20th century. BERNDT FRIBERG, a stoneware vase, Gustavsberg Stuido, year mark K.
ROYAL COPENHAGEN, an 80-piece 'Musselmalet' porcelain service, Denmark. A parcel gilt silver bowl on a wooden base by CG Hallberg Stockholm 1934. CARTIER, a 23-piece glass service 'La maison des Must', 1988. Two 19th Century gate leg tables with similar painting. Two large famille rose vases with covers, Qing dynasty, circa 1900. 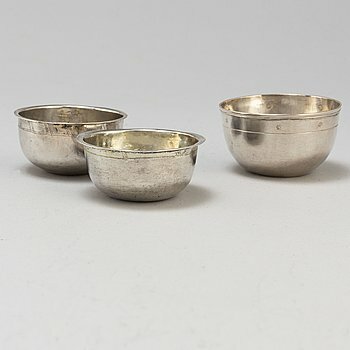 A four piece 20th century Art Deco silver coffee service. LATTIAMALJAKKO, posliinia, Kiina 1900-luvun loppupuoli. Three Vivianna Torun Bülow-Hübe brass candle golders, for Dansk International Design. A pair of caraffes with silver mountings by CG Hallberg, Stockholm 1890. A parcel gilt sterling silver vase by Atelier Borgila, Stockholm 1950. A pine table, 19th Century. TAPIO WIRKKALA, PIKAREITA, 2 kpl, hopeaa. Kultakeskus 1992. Four serving spoons and totally nine tablespoons, silver, 18th and 20th Century. CARL MALMSTEN, a table, Stolab, 2004.
a pewter vase by Björn Trägårdh for Firma Svenskt tenn 1931. A set of four Cosmos arm chairs first half of the 20th century. REIJO SIRKEOJA, KULHO, hopeaa, signeerattu RS. Kultakeskus, Hämeenlinna 1968. A pair of silver candelabras. A second part of the 20th century pine sofa by Göran Malmvall. Two mid 20th century stoneware vases by Gunnar Nylund, Rörstrand. A pair of silver candle sticks, Stockholm 1817.
a dining table from the early 20th century. SIGVARD BERNADOTTE, a no. 823 sterling silver beaker for Georg Jensen & Wendel, 1945-51. A pair of silver candle sticks by Eric Löfman, Uppsala 1961. KAHVIPANNU, hopeaa, Auran Kultaseppä oy, Turku 1959. A PAIR OF SWEDISH ART DECO SALT- AND PEPPER SHAKERS, silver, GAB 1936. A famille rose export porcelain serving dish, Qing dynasty, Qianlong (1736-95). A set of four 19th century chairs, probably Vienna. A set of five Baumann Jugend chairs eraly 1900's. A Chinese porcelain basin 19th century. K ANDERSSON, a silver bonbonniere, art nouveau, Stockholm 1918. A Swedish Rörstrand faience plate dated 1755. An English electorplated cover around 1900. ERIKA LAGERBIELKE, a 48 piece 'Trilogi' glass service, Orrefors. KAHVIASTIASTO, 13 osaa, riisiposliinia, Arabia, 1900-luvun loppupuoli ja loppu. Kolme osaa Friedl Holzer-Kjellberg. A SET OF FOUR CHAIRS 1970'S. A silver sugarbowl by a unknown master, S.t Petersburg 1908-26. Eightteen Russian19th Century silver forks from various makers. Nineteen 18th, 19th and 20th Century silver table spoons. A Swedish 20th century 36 piece silver cutlery, mark of MEMA and CGH, 1950's-70's. A Chinese yellow and grisaille glazed bottle vase, 20th century. 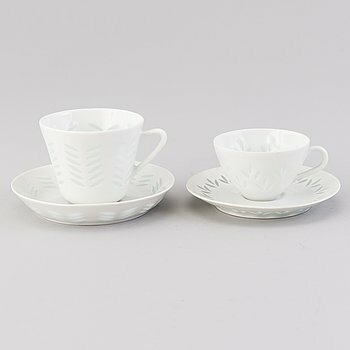 A Marianne Westman 'Mon Amie' part coffee and tea service, for Rörstrand (21 pieces). A blue and white six sided bowl, Qing dynasty, Kangxi (1662-1722). a pair of silver and galss salt cellars by CG Hallberg 1898. SIGVARD BERNADOTTE, RUOKA- ja KAHVIASTIASTO, 29 osaa, "Christineholm"/ "Marianne". A set of four leather armchairs alter part of the 20th century. KARAHVI ja PIKAREITA, 6 kpl, hopeaa, Auran Kultaseppä oy, Turku 1977. A seventy one pieces 'Musselmalet' porcelain dinner service ny Royal Copenhagen. Eight imari export porcelain plates, Qing dynasty, 18th century. A set of eight famille rose export porcelain plates, Qing dynasty, Qianlong (1736-95). ALF WALLANDER, An 18-piece crayfish service, creamware, Rörstrand. a set of four 'Musselmalet' porcelain bowls '1023' by Royal Copenhagen. SAMPPANJAJÄÄHDYTIN, hopeoitua messinkiä, noin 1900. ATERINSARJA, 51 osaa, hopeaa, "Chippendale", 1900-luvun loppu. ATERINSARJA, 36 osaa, hopeaa "Chippendale", Auran Kultaseppä 1980-luku. NANNY STILL, LASIA, "Harlekiini"-sarjaa, 9 osaa, Riihimäen Lasi, 1958-1968. NANNY STILL, karahveja, 3 kpl, "Zarina", Riihimäen Lasi. NANNY STILL, sarjasta "Zarina" ja "Flindari", Riihimäen Lasi. 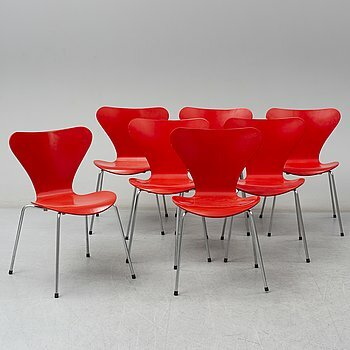 HANS J WEGNER, a set of 5 laquered Y-chairs, Denmark. Second half of the 20th century. A Chinese famille rose vase, early 20th century. Seven blue and white export porcelain dishes, Qing dynasty, Qianlong (1736-95). 211 psc silver cutlery, Spain, 20th century. A pair of silver bowls, GAB, Stockholm 1926. 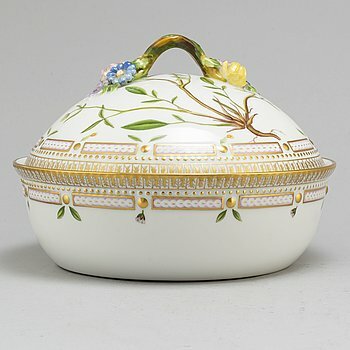 A 38 piece 'Empire' porcelain service, Rörstrand, early 20th century. KAHVI- ja TEEASTIASTO, 22 osaa, posliinia, Cobalt Net, Lomonosov, Neuvostoliitto. Eight porcelain coasters, Fornasetti, Milan, Italy. Fortyone pieces of Musselmalet dinner service from Royal Copenhagen. A Swedish Gustavian parcel-gilt silver cream-jug, mark Gustaf Hamnqvist, Åmål 1799. A 21st century tabl, House Doctor. FOUR CHINESE PORCELAIN DISHES, 18TH AND 19TH CENTURY. PAVEL OVCHINNIKOV, TEELUSIKOITA, 6 kpl, hopeaa, Moskova 1882-1899. Hovihankkijanleima. 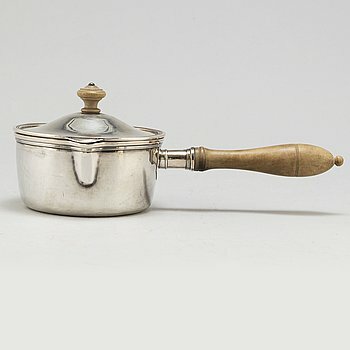 A silver sugar box by CG Hallberg Stockholm, 1912. 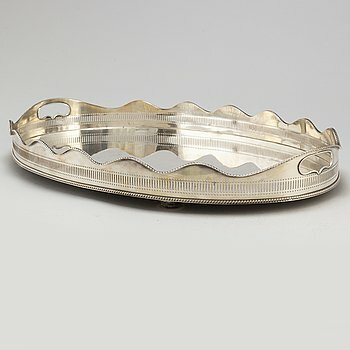 THREE silver trays by CG Halberg Stockholm 1933-41.